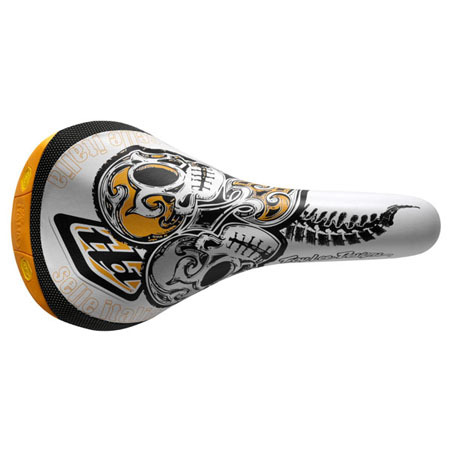 In addition to stocking the superb and sought after Selle Italia bicycle saddle line, Mountains Plus went big and now has the LIMITED EDITION Troy Lee Designs Selle Italia models!!! Troy Lee Designs artistic and eye-catching graphics have graced NASCAR, Supercross, Indy Car and World Cup Mountain Bikers helmets and race gear for years. By partnering with Selle Italia, the finest bicycle saddle maker in the universe, they bring to you the classic Selle Italia models with a new, fresh look that will turn heads. With a wide variety of saddles for different riding styles, Selle Italia has a seat that will make your rear end happy and your bike looking GOOD. 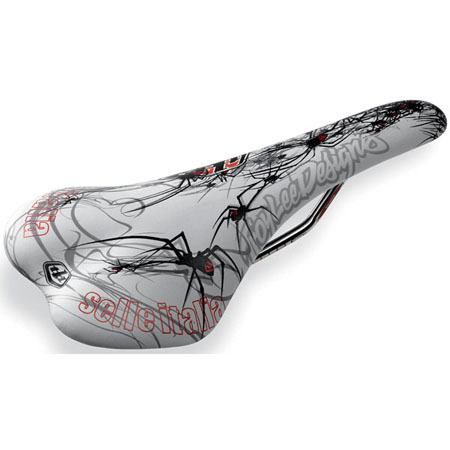 Mountains Plus has the Selle Italia SLR TLD road saddle with cool spider graphics for a smokin’ hot $149, the Selle Italia TLD Shiver free-ride MTB saddle with the patriotic flag-spray can motif for $90.99, the ever popular and classic Selle Italia Flite TLD with Troy’s signature flaming eye graphic for $155 and the sought after MTB free ride and XC Selle Italia Yuktaak saddle with skeleton themed art for $129. These are LIMITED EDITION…so when they are gone you won’t be able to get your hands, or rear, on them again so get em’ while they’re hot! « Louis Garneau Helmets and Shoes in the house!! !